It was supper time when I finished touring Fort Battleford and the skies were darker than they'd been all day. I wanted to tour the Hudson's Bay Fur Trading Post of Fort Carlton next so needed to find a motel somewhere close by for the night. 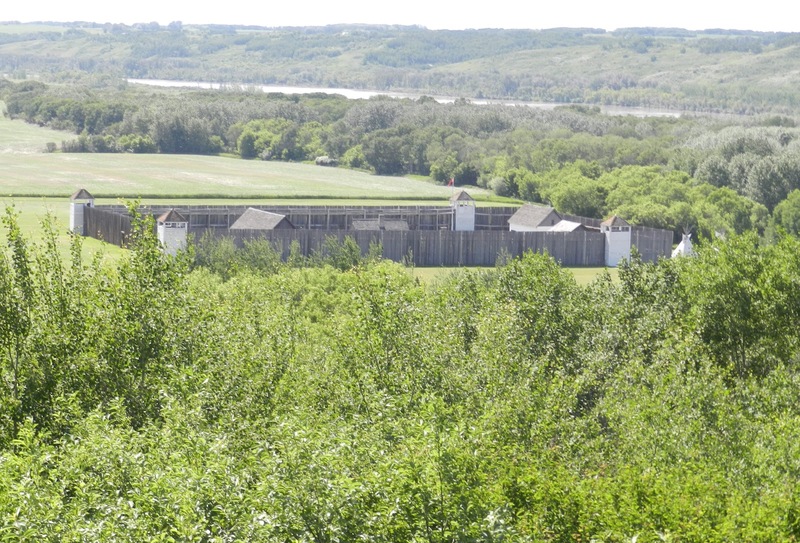 The problem was that Fort Carlton lay in an area filled with campgrounds, but no hotels, etc. As if the only people visiting the Trails of 1885 locations were there for family vacations. 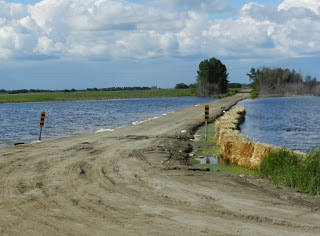 Since Fort Carlton lay east of me, I also had to make the choice of going cross-country on gravel roads or dipping down for a couple hours on a double highway to Saskatoon, and then heading north-northeast - still on a paved road. With dark, rumbling clouds closing in, I chose the latter. The last thing I wanted was to get stuck in muck on a deserted road. Halfway to the the city of Saskatoon, the clouds opened and I had to slow down because my wipers couldn't keep up with the deluge. Talk about praising God for helping me make the right decision! The storm was short-lived and I drove on to Saskatoon with the setting sun behind me, and turned onto the road that would take me into the heart of the Trails of 1885 territory. My immediate concern was somewhere to sleep, but when I finally found a motel, it was full. That meant I had 3 choices: drive the 40 mins back to Saskatoon, drive another hour up the road to Prince Albert, or stay in a hotel where I had to register in the bar. I chose the bar with hotel attached since a decent-looking restaurant was part of the establishment and the price was half what I would've paid in the city. 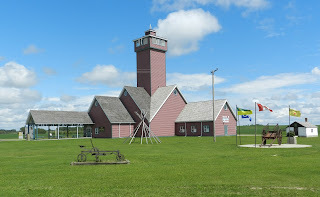 After a filling breakfast, I headed north to Duck Lake where a new museum had opened to display all the artifacts found when Parks Canada was cleaning the Fort Carlton site in preparation for the current fort. The artifacts include items from the NorthWest Rebellion, the Duck Lake Massacre, and other items pertaining to the settlement of the area. 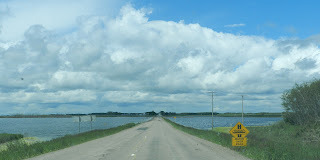 Just west of Duck Lake, I came up to the sign that said, 'Water Over the Road'. I'd never seen the sign until last spring. Now, they're everwhere. I found out later that this lake is really a farmer's field. He hasn't seen his soil since last spring. This is half way across the lake/field where a road leads off on either side. With the water logged ground, it won't take much for the water to cover this road again. Soon after, I reached Fort Carleton. To see where I had to go to get this view of the fort, check out my post, Pushing My Limits. Looking in the gate of Fort Carleton. 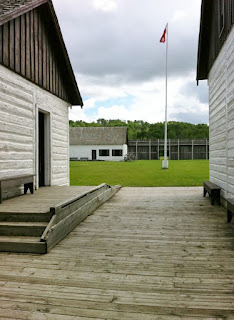 Looking through the gate at the Hudson's Bay Company's Fur Trading Post of Fort Carlton. 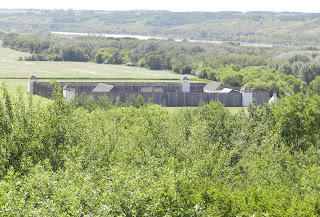 The fort began as a provisioning post where it traded the makings of pemmican with the Indians and sent it on the York boats that ran the nearby North Saskatchewan River. Due to its location, it evolved into an important fur trading post. 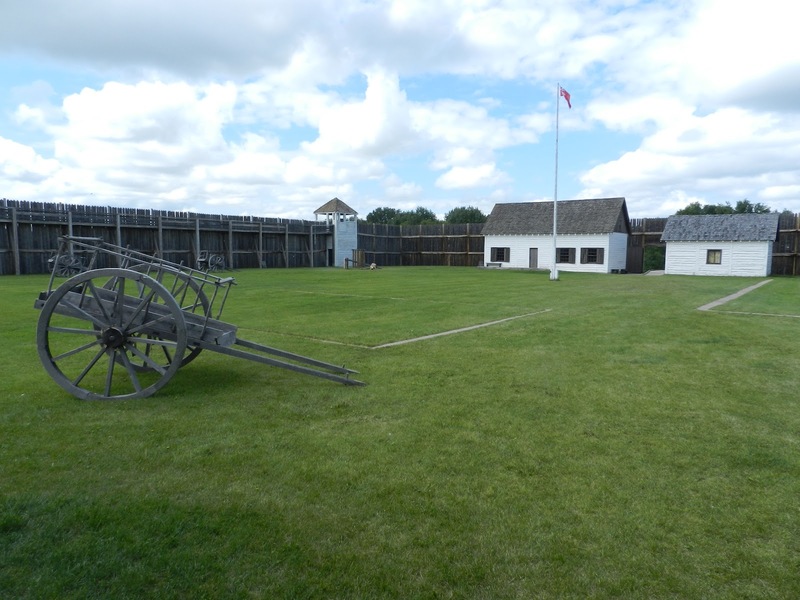 In 1885 when the NorthWest Rebellion was being fought just north of the fort, the HBC became concerned for its employees and ordered the fort to be evacuated. In the haste and confusion that followed, a lantern was knocked over and Fort Carlton burned to the ground. The HBC did not rebuild it. However, in 1967, Parks Canada reconstructed the fort. As such, it is not a recreation and it contains no antiques nor artifacts. Those are all housed in the Duck Lake Historical Museum. 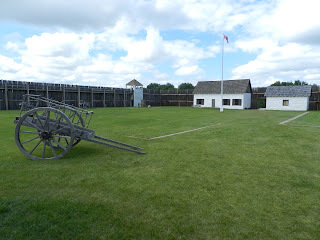 If you look at this photo taken inside the walls of Fort Carleton, you can see the lines on the ground that show where more buildings had been before 1885 when the fort burned down. Furs and provisions were kept in the storehouse until needed. The photo shows a felted beaver hat which was the height of fashion for the well dressed gentlemen in the North American east and in Europe. 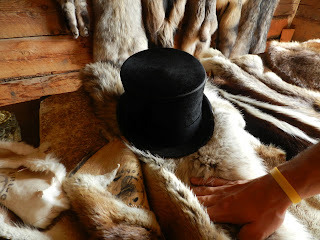 Beaver hat on furs in the For Carlton storehouse. The trading post carried everything from needles and flint to ready made coats and other articles of clothing. 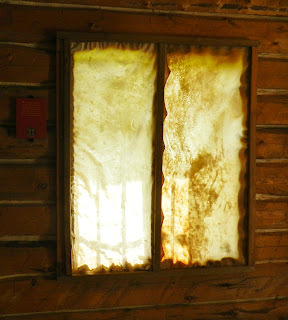 These windows were a fabulous find, because it was the first time I had a chance to see authentic rawhide windows. I left Fort Carlton and drove back to Duck Lake. 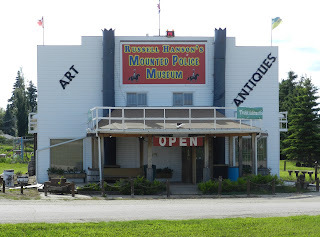 I wanted to see Russell Hanson's Mounted Police Museum, housed in the old Duck Lake Museum, because nothing had been set up when I went through last year. What a difference. 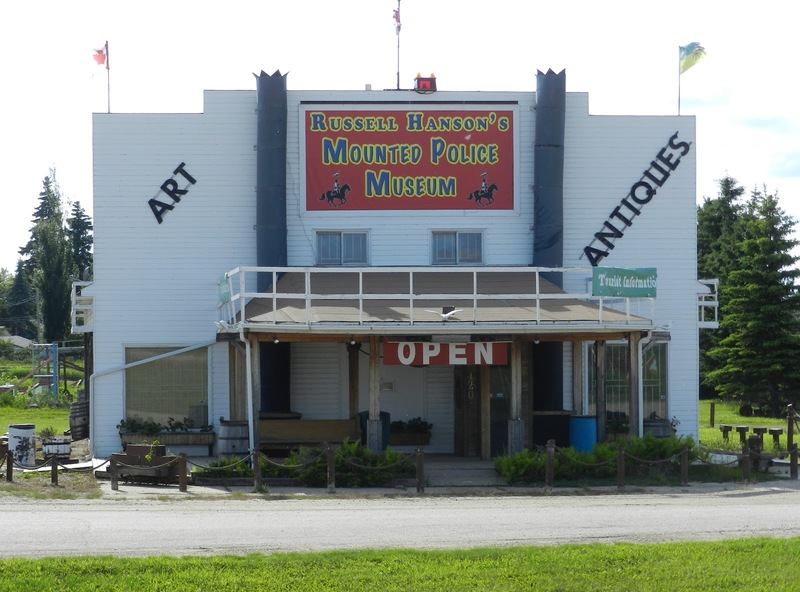 Everything was on display from Mountie uniforms to a very old Mammoth tusk found in the area years ago. 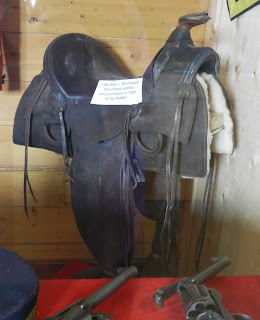 One of the most interesting items for research purposes was this 1882 Main + Winchester saddle with a sign that said, "100 of these saddles were purchased in 1883 by the NWMP". Do you see the guns in the foreground? The one on the right is the one Russell let me hold and open last year when I came through. I felt the weight of it, and saw how it opened for cleaning purposes. To hold a weapon that old was something I couldn't get from a book or photograph. By now it was 5:30 pm and there was only one thing left on my immediate agenda... take a ferry across the South Saskatchewan River. 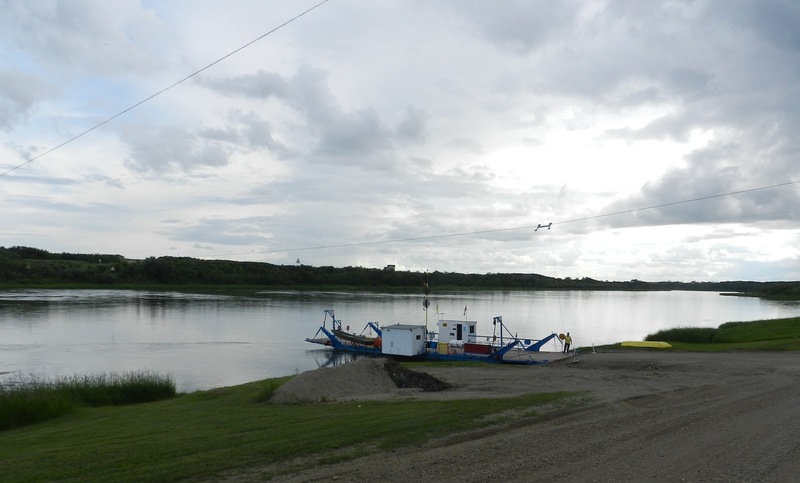 Both the North and South Saskatchewans were important rivers during the early years and are still in use but for recreational purposes only due to shifting sandbars and progress such as the Diefenbaker Dam. But the ferries still exist, some in the original locations of the Trails of 1885. 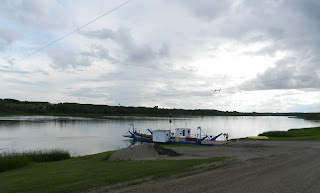 I wanted to experience what it was like to cross the river on a small ferry. The closest ferry to Duck Lake, however, was closed. I headed south hoping one of the two remaining area ferries in the area were open. A highway sign said the Hague Ferry was open, so I zipped east. I drove over a rise and there it was. The ferryman must've heard me coming because he was already standing there with a stop sign. I drove down and followed his directions onto the centre of the ferry. Technically it holds 6 vehicles, but since he crosses on demand, and I was his only customer, I got centre spot. As soon as I parked, I left my vehicle and put my camera mode to record. I wanted to latch onto as much information as I could get out of the ferry man. I was blessed, because the guy was a talker and even finished my sentences for me when I was too slow to get them out. I did get some great info though. I taped the complete ride to remind myself of the width and depth of this historic river. Have you ever taken a ferry ride? Where? What river? What size of ferry? Wow, sounds like some trip, Anita. I think it confirms in me that I made the right decision to not write historicals. I enjoy reading them from time to time, but the research that goes into them is not the joy for me that it appears to be for you. And I do recall being on a ferry once. I think we were headed to the Outer Banks of North Carolina. Big ferry, as I recall. I remember that someone wanted to start a ferry service across Lake Ontario, stretching from Rochester (and later Buffalo) to Toronto. I was looking forward to that, but I think they went defunct before they made their expansion. Too bad, that would have been a nice option. Hey Barb, I never thought of a ferry service across Lake Ontario, but it sure would solve some of the congestion at current border crossings. Perhaps that's why the idea failed ... they'd need another border crossing at each end. Then you'd have to beef up security due to terrorism, etc. The ferry on the Outer Banks of North Carolina... was it one of those huge hovercrafts? I've seen those in Victoria, BC, but never crossed on one. Love the post, Anita. What a rich experience! I envy you! Thanks for the fascinating post, Anita. Great photos, as usual. When I was planning my agenda from Vancouver to Seattle, I considered the Victoria clipper ferry service. However, the timings didn't work out and then I discovered Amtrak has a bus from Vancouver right to the Seattle station where I was to meet her, so that was the sensible solution. Much cheaper, too. Still, the Victoria clipper looks fabulous and someday I'd love to take the adventure. That's sad that you didn't get to meet Suzie at that time, but I'm so excited that I'll meet you both within the next 2 weeks. Squeeee! So I just realized that while editing my comment about the Victoria clipper ferry I deleted the part about meeting Suzie at the Seattle Amtrak station, so no one knew who I meant by 'her'. Whoops. I wish you lived closer, Anita! Several years back I tried to convince my family to come see the trail that crosses southwestern Wyoming... the ruts are still there, more than a century later. They didn't take me up on my excited offer! I've taken a number of ferry rides, including the James River and the Elizabeth River. Also to the Isle of Wight in England. And here's a comment from Suzie J. For some reason I can't comment on your post. Have you seen Leap Year with Amy Adams? She checks into a hotel in the bar and your experience reminded me of it. Ferries? We have lots of them here, but I've never crossed a river on one. The ferries vary in size from 50 cars to 100 cars, but they don't compare to the Canadian ferries in BC. Those are pretty awesome! ...the trail that crosses southwestern Wyoming... the ruts are still there, more than a century later. Niki, that reminds me of the Oregon Trail Ruts at Guernsey in southeastern Wyoming. I drove several hours out of my way (I was heading to Denver) to see those and stand between the ruts. Such an inspiring and emotional experience, I stood there crying. If I've ever experienced a rift in the space-time continuum, it was up there. I even wrote a poem about the experience and posted it here on Inkwell when I got back from the ACFW Denver 2009 conference. You can read it <a href="http://www.inkwellinspirations.com/2009/09/you-were-by-my-side.html>here</a>. So, I can honestly say, I would have loved to go on an adventure with you, Niki. I have a soft spot on my heart for anything to do with settling the west. So if you ever hear of me heading your way again, speak up, okay? Dina, I'm familiar with the Isle of Wight, but not the James or Elizabeth Rivers. Are they somewhere in the Northeast? Leap Year was the movie we watched on the last night of our writing retreat. I'd never heard of it before and now I wouldn't mind watching it again. But the funny part is that I never even thought of it the night I stayed there. My first ever ferry ride was back in the 70's when we were touring BC in our motorhome. Although our RV was a 20 footer, we had to pay for an extra foot in the front because of our bike rack, and for an extra foot in the back for our spare tire. Sheesh. Anita, the James River is in Virginia and is where the Jamestown settlement is. Part of the "Historic Triangle of Yorktown, Jamestown and Williamsburg which I had the pleasure of visiting in March. Well, if it weren't' for money and such, I'd volunteer to go on any research trip with any of the Inkies. Niki, I think you should just go on your own. It's great, right Anita!? Thanks for another installment. I am so excited about my upcoming research trip, which I'm sure will be a future blog as well. Great job and photos, Anita! Yes, and the Elizabeth River is between Norfolk and Portsmouth, Virginia. Like Dina, I've been on the James River Ferry umpteen times, and when I took the pictures of the tall ships last month, some of those were from the Elizabeth River ferry. Let's see, also the one from Hatteras to Ocracoke, the one from Victoria to Vancouver, the one across Lake Michigan from Wisconsin to Michigan, and the one from Currituck to Knotts Island (NC). I really, really want to go to Tangier Island (VA) sometime. That ferry is for passengers only, so it's really more of a boat ride than a ferry. Tangier Island is quite remote, and the natives still speak with an Elizabethan-era dialect. I don't see the ferry as having a problem getting to the sea... or travelling across it... as long as they didn't try to tow it across. And yes, I agree that if no one wants to go with Niki, she should just go by yourself - unless you're going to the back country where there are bears... and mountain lions... and badgers and stuff, eh. Debra, I'm very excited about your research trip. You'd better blog about it! Thanks for coming back and explaining, Dina. Tangier Island? Oh, that's another intriguing place.